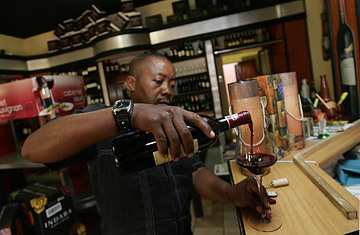 Mnikelo Mangciphu, who has the only wine shop in Soweto, serves a glass of wine. When Selena Cuffe was in Johannesburg to promote an international student exchange nearly two years ago, an advertisement for the first Soweto Wine Festival caught her eye. Raised in California, Cuffe was no stranger to wine events. But seeing Soweto--the poor township where Nelson Mandela and Desmond Tutu had battled apartheid--coupled with wine threw her. "They have wine there?" Cuffe wondered. The festival held more surprises. Purveyors who displayed and poured their bounty were black. Cuffe learned that one wine she especially liked barely had distribution in South Africa, let alone in the U.S. A month later, in October 2005, Cuffe and her husband Khary--they live near Cincinnati, Ohio--launched Heritage Link Brands. "Who wouldn't want to support these vintners if their wines are as good as or better than those produced elsewhere?" she asks. Heritage--she's president and CEO, and he's CFO--imports, distributes and also sells heritagelinkbrands.com 10 wines from the Western Cape, all of them produced by blacks who own the land or the facilities or the brand. Heritage projects revenues of $1.2 million for 2007. In 2006, Wines of South Africa (WOSA), a trade group of exporters, reported that nearly 30 million cases were shipped. More than 1 million of those cases landed in the U.S. Since 2000, exports have typically grown about 250,000 cases annually. Says Rory Callahan, president of Wine & Food Associates, a marketing company that represents WOSA: "There is strong interest in wines from nontraditional growing areas." Vivian Kleynhans, whose Cape Town company, African Roots Wine Brands, has produced wine for four years, also heads the South African Black Vintners Alliance (SABVA), a group of 10 companies whose U.S. importer is Heritage. She says that before Heritage, her products had been turned down by several local distributors and retailers. "Things are tough," says Kleynhans, who cites black wine producers' difficulties in getting loans and finding distribution and their having to cope with white producers with an exclusionist mentality. And getting tougher. The government has mandated raising black participation in the economy to 25% by 2014, but a setback occurred this month when the South African Wine Industry Trust, created in 1999 to support black economic empowerment in the wine industry, temporarily suspended funding to its beneficiaries, which include black vintners and SABVA. Yet Kleynhans says she knows of at least one company in the process of closing. The group plans to request funding for SABVA and its members directly from the government. The setback doesn't surprise George B.N. Ayittey, professor of economics at American University, who says that an earlier black-empowerment program enriched merely a few black élites. "There are a lot of broken promises in South Africa," he says. Cuffe concedes that there haven't been many "feel-good stories" in the wine industry, but she's trying to change that. By year's end, Heritage will have added eight more black-produced wines to its portfolio. The question, though, is whether retailers care about selling black-produced wines simply because these vintners were excluded by a repressive regime. Peter McCann, wine buyer for Whole Foods Market's Cambridge, Mass., store, agrees there's appeal in selling a wine that can better the lot of its producers. He stocks Heritage offerings from the Seven Sisters brand owned by Kleynhans. The first Heritage wine he added was its top-selling import, Bouwland Cabernet Sauvignon Merlot. McCann likes the wine for its medium body and red and dark fruit flavors. And with the wine selling at $11.99 retail, he loves its impressive quality-for-price ratio. A feel-good story is very nice, but a feel-good wine is even better.